In operation since 1947, Hughes Bros. Aircrafters, Inc. has been at the forefront in the manufacture of precision airframe sheet metal details and assemblies. We are renown for our abilities to take a project from blueprint or digital data to complete product. 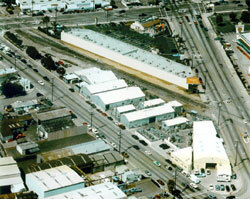 Since it's inception, Hughes Bros. has been under the same ownership at the same location within the Los Angeles Mid-Alameda Corridor Enterprise zone. We are a woman-owned small business with a facility covering 65,000 sq. ft. This foundation and longevity has and continues to provide our customers the confidence that every product that we manufacture is the best quality possible. We continue to strive to remain and industry leader. With the tried and true method of drop hammer forming - our core competency, along with deep draw, hydroforming and rubberbox forming, we have blended ourselves with the latest technology in order to support the newest generation of aircraft. *We have approvals for the model-based definition and digital product definition per Boeing D6-51991 Rev L using CATIA V5-6R2018. *Our product inspections are completed using a Faro Edge series Coordinate Measuring Machine (CMM). *We are Nadcap Heat Treat accredited to AC7102, AC7102S, AC7102/2, AC7102/5, AC7102/8 and are SGS certified for Quality System AS9100D, ISO 9001:2015. *We are certified by the U.S. Department of State, International Traffic in Arms Regulation *ITAR) #M24026. We welcome all inquiries as to our capabilities and look forward to maintaining old relationships as well as establishing new ones.